Photometric observations of this candidate microlensing event are presented and interpreted. New time-series are presented for this intermediate polar cataclysmic system, undergoing a new fading. This is a follow-up of my 2004-16 observations. The minor planet 131 Vala was observed to occult star TYC 6185-00247-1 on 2017 Apr 8. The occultation duration was 8.914±0.069s. Time-series at the outburst of March-April 2017 are reported. 146 Lucina was observed to occult TYC 1898-02675-1 on 2016 Nov 30. The occultation duration was 9.03±0.42s. In 2016, the intermediate polar FO Aqr has been observed in an unusual low state and slowly recovering. The O-C are compared with those from my previous observations. Twelve seasons, from 2004 to 2015, of photometric monitoring of the intermediate polar FO Aqr are presented and are compared with previous observations. The ambiguities in the cycle counting can be lifted and a new O-C diagram, spanning 34 y,r is presented, along with new ephemerides. Twelve seasons, from 2005 to 2016, of photometric monitoring of the intermediate polar BG CMi are presented and are compared with previous observations. The spin up of the white dwarf is found to have undergone a major change between 1996 and 2005. There is also some evidence for sideband signals. Photometric observations of the RR Lyrae star GSC 318-905/V551 Vir are presented and analyzed. 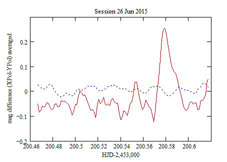 They show a Blazhko modulation with a period of 53.9 days and evidence for irregularities. An animation showing the Blazhko modulation is presented. Time series of this contact binary in a ternary system are presented. 3 ToMs are measured along with the B-V and V-Rc colors. The linear polarization of this cataclysmic polar is detected, and the orbital minima are found to be way off from the 1993 ephemeris. Eleven seasons, from 2004 to 2014, of photometric monitoring of the intermediate polar AO Psc are presented and are compared with previous observations. The spin up of the white dwarf is found to be slowing down. The amplitudes of the modulated and non-modulated components of the brightness are found to have undergone a major change in 2007. Time series, through polarization filters, of the binary system with a black hole V404 Cyg, during its June 2015 outburst, are presented. A quick introduction to Special Relativity with a derivation of E=mc2. Photometric observations in 2010-2014 of the RR Lyrae star AR Serpentis are presented and analyzed. Two Blazhko modulations of comparable amplitude are detected, with the periods 89 and 108 days, and with evidence for irregularities. 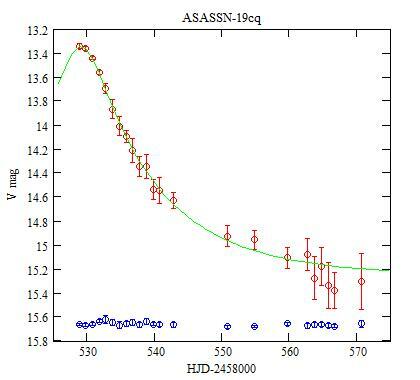 Photometry observations of the asynchronous polar V1432 Aql are presented. Ephemerides for the orbital motion and for the spin are derived and are compared with previous ephemerides. For the spin, there is some evidence for a secondary derivative of the period. 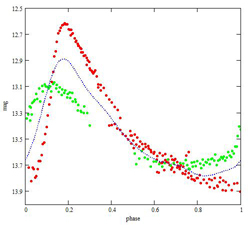 Photometry observations of this RRAB pulsating star are presented, with an animation showing the Blazhko modulation. Time-series are presented for this pulsating star, after its sudden pulsation change in 2008 and after the 2010-2011 season observations. Time series for this unusual cataclysmic star are presented. This cataclysmic polar with deep, narrow eclipses has dropped by 2 magnitudes since September 2011. 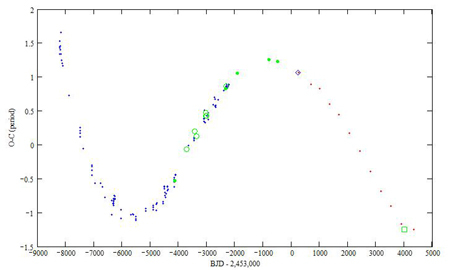 Light curves for this binary asteroid are presented, showing the spin modulation and eclipses. 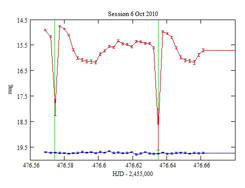 Time-series of VX Hya from March 2005 to April 2010 are analyzed. A period jump is discovered to happen in 2008 in all the pulsation modes, being at its strongest for the overtone. A light curve of this cataclysmic system in outburst is reported. 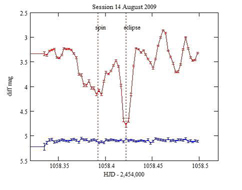 Time series of this eclipsing contact binary are reported and times of minima (ToM) of the eclipses are measured. This system has a third component. From the O-C analysis of the observed ToM and of those in the literature, the orbital parameters of the third body can be derived: the orbital period is 34.8 yr and the inclination is 11.5 °. 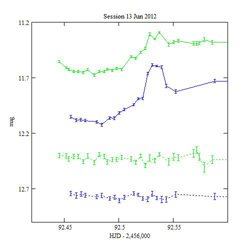 Time-series are presented and are modelled with BinaryMaker3. Time-series are obtained for this asteroid. A period of rotation of 22.53 h is derived using a Monte Carlo algorithm. A phase plot of this eclipsing polar is presented. I try to model it with BinaryMaker3. Multicolor photometric measurements of this Cepheid in an eclipsing binary system (the only known one in our galaxy) are presented. 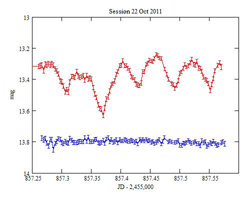 Time series of this DSCT pulsating star with a period of 2.1h are presented and compared with 2004-2005 observations. 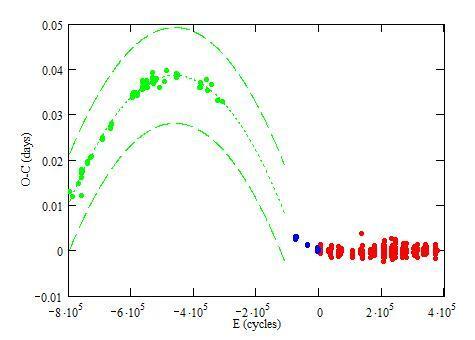 A phase plot for this rotating (period 2.2h), magnetic, lone white dwarf is presented. 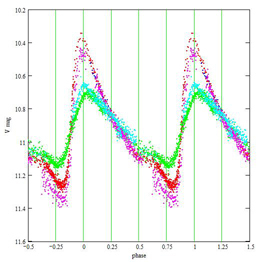 B,V photometry measurements of this Cepheid are presented. The distance, temperature and radius of this pulsating star are computed. Photometry of this pulsating supergiant star (33d period) are presented. The magnitudes are compared with published observations. The measurements are also corrected for a nearby star. Variations of the color, temperature, radius and luminosity are inferred. Time series for this deeply eclipsing cataclysmic system are presented. The M11 open cluster (Wild Duck cluster, NGC6705) is observed through B and V filters. An HR diagram is constructed. It is compared with an absolute HR diagram made from Hipparcos data which measured the parallaxes of nearby stars. The distance to M11 is then derived. The interstellar extinction is taken into account using the Henden's sequence for M11 (U data). Within the framework of Mach's principle and of D.W. Sciama's physical interpretation of it, a quantitative evaluation of the inertial mass as a function of the density of the universe and of the epoch is obtained. The calculation is somewhat similar to the solution of Olbers's paradox. The result shows that the inertial mass varies as the universe expands except for a flat, Euclidean universe. This leads to insights on the Principle of Equivalence. Time series showing the eclipse with a large hump are presented. They are modelized with BinaryMaker3. Rotation curves of this asteroid are presented. V and B magnitudes measurements are obtained for this Population II Cepheid pulsating star. They are used to compute the variations of temperature, radius and radial velocity. The results are compared with direct measurements from spectroscopy. Time-series of this intermediate polar were carried out with B and V filters. Flares were observed with strong color changes. Observations with a 20 cm telescope and an animation. Two-color time-series of this pulsating RR Lyrae are obtained. The pulsation is checked against the ephemeris. The temperature and radius variations are computed from several models. More in the Site map and in the Index.